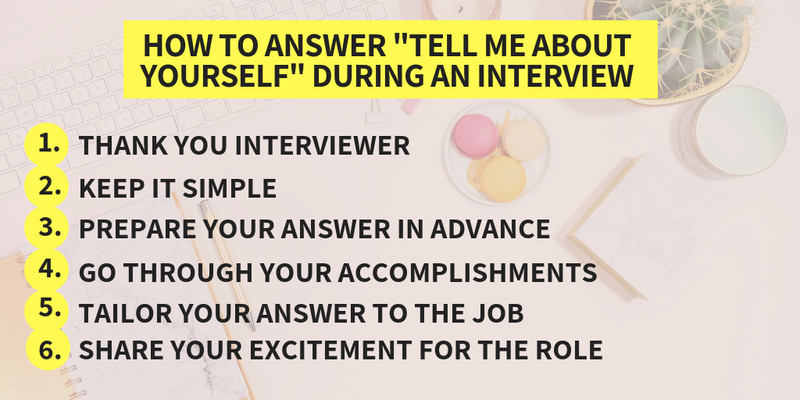 You’ve just sat down for a job interview and the interviewer opens with the question, “tell me about yourself.” Even though this is a vague interview question, it’s one of the most common interview openers! The reality: the interview does not want to know that you love board games or watch The Bachelor religiously when asking “tell me about yourself”. They want to know your professional journey, sprinkled with your accomplishments. In my opinion, this interview question is actually tough because you have to run through your accomplishments while staying humble, and tailoring your answer to the job. When I’ve interviewed, I’ve always prepared this answer in advance. The trick is to tailor your answer to the job and really practice this question in advance. Answering “tell me about yourself” well will completely set your tone for the rest of the conversation with your interviewer. Here’s my formula for answering, “tell me about yourself” during an interview. When someone is interviewing you, they really are taking time out of their day to learn more about YOU. I always start answering, “tell me about yourself” by thanking the interviewer for your time. You can simply say, “Before I start, I want to thank you for taking the time to chat with me today. I’m truly excited about X role and cannot wait to learn more…” Then start your official answer! No one wants to hear you drag on for hours. Even though your mother may want to hear your story about you winning the 5th grade spelling bee for the umpteenth time, keep your answer to professional accomplishments and experiences only. Many interviews are only thirty minutes, so ensure you prepared a succinct answer in advance! A rule of thumb for what experience you should share is not to go back to college, anything after college seems to a fair game to me. For me, I like to run through my experience quickly by saying phrases like, “I’ve had a variety of experiences including…” and then you can list three or four things. As I’ve said before, odds are – your interviewer WILL answer this question in some form. They may phrase it like, run me through your resume, or something of that sort. So prepare in advance! Try standing in front of a mirror and practicing your answer. You can even time yourself to ensure you can finish it in a minute or two. Get creative in simplifying all the different things you’ve done while adding more jobs and experiences in! The trick with answering this interview question well is to run through a few of your professional accomplishments and skills in a simple way. As I mentioned above, you can easily mention a few of the places you’ve worked by saying phrases like, “I have a variety of experiences such as…” and my professional accomplishments range from…”, this gives you an opportunity to give an example of the great work you’ve done! When your brainstorming which examples of what you’ve done in your career to share during your answer, tailor your answer to the job. Look through the job description and specifically find examples that align with things in the role that hiring manager may want you to be good at. Even if you are going through a career change or slightly changing your role, you can still find examples of things that you’ve done that align with that new job. All interviewers want to know that you are excited about the job at hand. You’ll hear me say this time and time again, but no one wants to hire someone who is NOT excited about the job! Now that you know how to answer “tell me about yourself”, here’s what not to say during that portion of your job interview. When someone asks you this question, you don’t want to drone on and on and rehash your resume! You want to keep your answers concise while still running through your accomplishments. Lastly, don’t forget to simply be comfortable talking about your accomplishments. 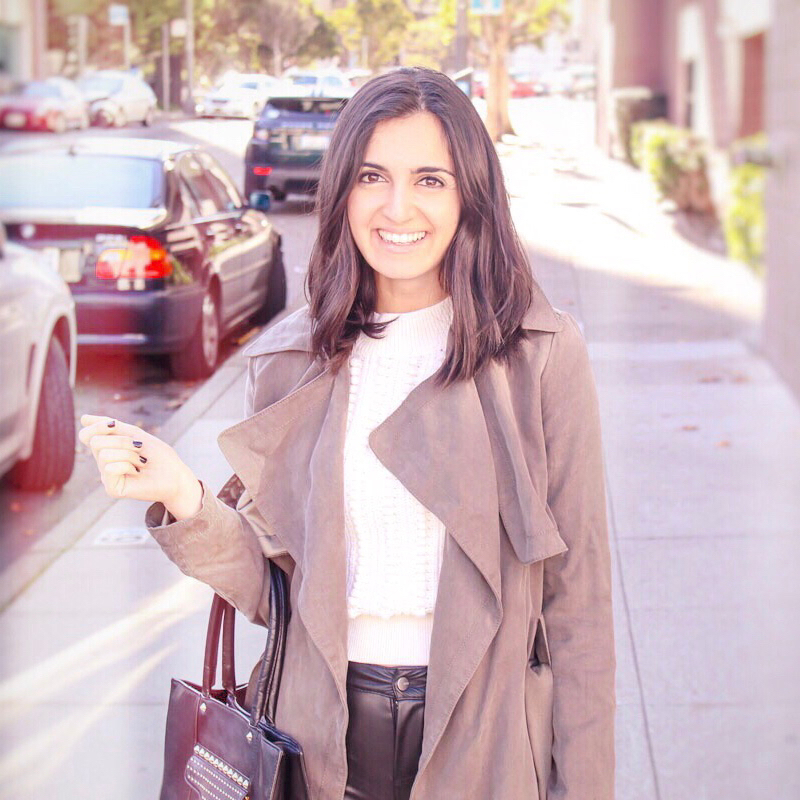 You don’t want to be too modest – you earned these accomplishments and you deserve to be here. 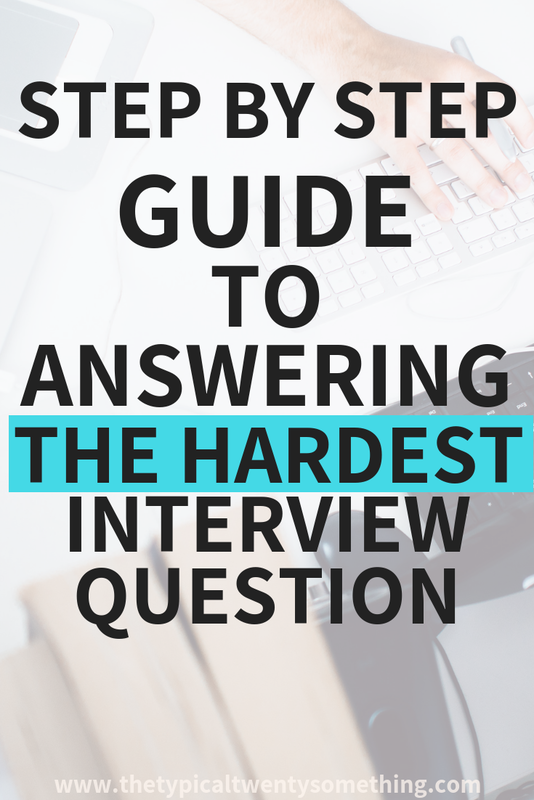 How do you answer tough interview questions? Comment below! “Why should we hire you?” is definitely a difficult question for someone to ask me. I never know how to answer because I feel that I will end up coming across as desperate or not give a good enough answer for them to want to hire me! That one is SOOOO hard! I will 100% address that at some point if you’d like! Also, can you DM me so I can send you a gift card?! Thanks for your insight! XO! 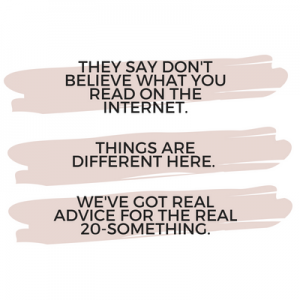 My IG is @thetypicaltwentysomething!!! Or email me! One time I got the question “what will you bring to our table within the first six months of working here?” It took me off guard, I feel so inadequate compared to other employees there! 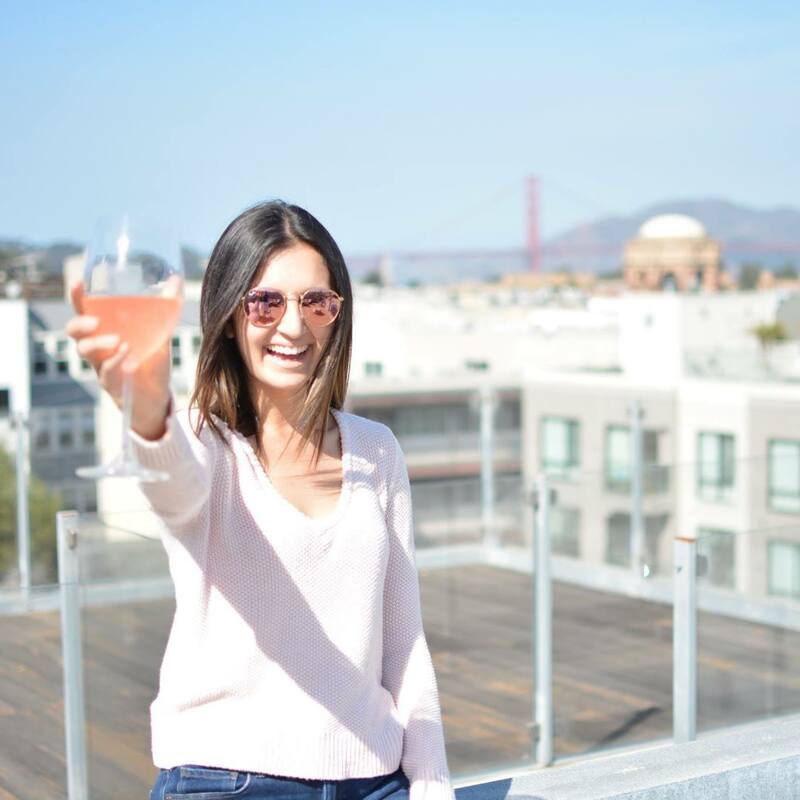 Is my go getter attitude or new perspective enough? Also it would be so helpful to read a post about the comment below! Hiii love! 1. I’M SO SORRY THIS IS A LATE RESPONSE! That is so unlike me! Thank you so much for commenting 2. I will totally write posts on both this question AND the one below this weekend. Will have it to you next Monday! 3. That is a tough question! I think pulling on your last experiences is a fantastic way to say you’ll bring a unique perspective, and you can mention combined with the fact that your a hard worker will allow you to hit the ground running and make a splash on your business! LMK if that helps!